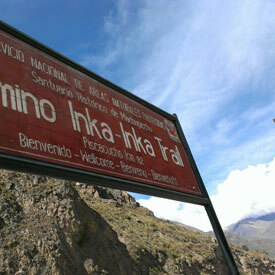 I spent October 11-14, 2013, hiking the Inca Trail. Here is the story of my experience. Piled into a bus for a bumpy one-lane-dirt-road ride to our beginning place, Kilometer 82. Our bus driver, who on the day prior had proved himself worthy of lots of bonus points for fast/dangerous video-game driving, would nose right up to any buses heading the opposite direction and have a stare-off to determine who had to back up to let the other pass. Our driver won all three times. Once at the trailhead the porters carefully weighed our bags — amazingly, no drama with anyone trying to bring extra stuff. Our party of 14 hikers plus 20 porters, two cooks, and two guides (our assistant guide was named Jesus, which was an endless fount of jokes: “Everyone please follow Jesus”, “Jesus spoke to me”, “Thank you Jesus!”) walked and walked and walked, through any number of small rustic settlements where they charged 30 cents to use the toilet, and wanted to sell us water and Gatorade. There were lots of horses and burros along the trail hauling supplies to other settlements further up. We also passed by numerous tiny Inca bars (marked, not with a sign, but with a red plastic bag, for some reason) where the porters could get wasted on fermented corn beer called chicha. We were forbidden from sampling this stuff. First night’s campsite was in someone’s backyard. She sold us massive beers for $3.00. The porters had arrived early, set up our tents and laid out bowls of warm water for us to wash our faces and hands in. So swanky! Dinner was excellent too — soup and rice and veggies prepared by our hike-along chef. He gave us different types of soup for every meal on the trek and it was awesome. Peruvians know their soups… even a hundred miles from nowhere with only the ingredients they can carry on their backs. Wakeup call at 5am, breakfast at 5:30am, hike at 6:15am. This was billed as the toughest hiking day; six hours of mostly uphill climbing, with a 3,000′ elevation gain to a grim place named Dead Woman’s Pass. Eek. It was hot, dry and dusty — basically a desert situation with cacti and everything. I remembered to put on sunscreen, luckily. We stopped for lunch in a small green valley with llamas, alpacas, and old ladies selling snacks and drinks. This was the last place along the trail that civilization touched, at least until Machu Picchu, so I bought spare headlamp batteries and some beer. Once we got to the top of the pass a couple hours later I was quite tired. At almost 12,000′ it’s difficult to catch one’s breath so I had to stop to rest far more often than usual. The view from the pass was astounding though. Standing in the saddle between two mountains we could see the desert where we’d come from and a much greener, lusher area ahead. 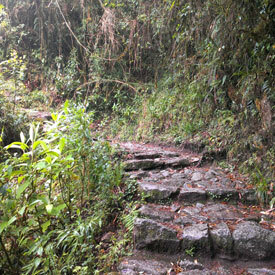 It was a steep hike downhill to our second campsite, which I took slow for fear of injuring a knee. Still I walked into camp at about 2:30pm, so there was plenty of time to relax before dinner, which involved more soup of course, and some fish and hot chocolate. Another early wake-up call and we were on the trail by 6:15am again. I was most nervous about this day’s hiking since it was nearly all downhill — and 11 hours on the trail! 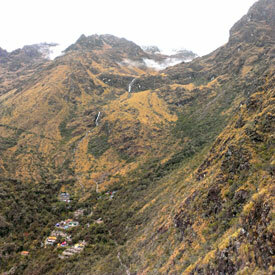 — and I had heard about the crazy Inca staircases we were to descend. Steep stone steps very unevenly spaced. Scary. Not to mention the fact that it began to rain very hard shortly after we got on the trail. And rained, and rained. In fact I remember very little about the first half of this day other than the rain. We hiked until 1pm when we finally stopped for lunch on the top of a mountain that surely had a wonderful view if only it hadn’t been socked in by a raincloud. One of the hikers in our group had gotten sick, was chilled and weak, and was just barely able to hold himself together enough to get to our lunch spot. He collapsed into our gear tent and napped while the rest of us had lunch in another tent. More soup: very warming. And then, a miracle! It stopped raining at long last! We still had four more hours of hiking and this was the steepest downhill portion of the trail, so seeing the weather clear up lightened everyone’s mood considerably. It was during this stretch of the hike that I had a small but important revelation, too. I had been so worried about my knees and steep stairs that I’d been going very slowly, but I was impressed with our porters’ ability to sprint down the trail even with their unwieldy fifty-pound packs on their backs. How did they do it? Well, obviously, it took some practice and a lot of strength, but it also seemed that they hiked on their toes rather than their heels. I thought about this and realized that it’s a lot more traumatic on your knees if you come down on your heel, even though that feels most comfortable and stable. Also, Luis, our head guide, told me that it’s better on the knees to go more quickly down hills, using your trekking poles more for balance than for support. I think both these tips really saved my knees on the hike and I’m definitely going to remember them for future hikes back home as well. I’m surprised nobody fell, but we all did quite well, even the sick guy. We mostly dried off as it got warmer and we descended into the jungle. Finally rolled into camp, totally exhausted, at 5pm. 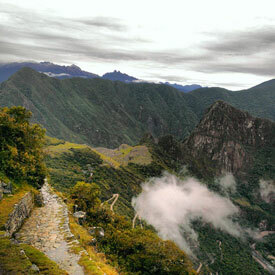 A really long day but it brought our trek nearly to an end — Machu Picchu mountain was in sight across the valley! Somehow our cooks made cake and jello to celebrate that achievement, and then with instructions to wake up at 3:45am to complete the final stretch, we all went to bed super early. Packed up camp and breakfasted by 4:45am, but then we had to line up at the final trail checkpoint and wait for it to open at 5:30am. I’m still unclear about exactly why we had to get up so early, but that did mean we arrived at the Sun Gate — the entrance to Machu Picchu that’s perched on top of a ridge a couple hundred meters above the main site of the city — nice and early, at around 7:30am. The morning clouds had just lifted and the view was breathtaking! It seemed like a dream or fairy tale. You’ve seen the images we’ve all seen of Machu Picchu, but to actually be there — to take in the panoramas with your own eyes — well, it’s sure to be something to remember for life. Thousands of feet up a nearly-sheer but densely-vegetated cliff face, and all but invisible from the valley floor so far below, the Incas chose this mountaintop spot for its religious significance and proceeded to carve up the granite mountain to build temples, a school, homes, and terraces and storehouses to grow and store food for the few hundred important people who lived there. After a few hours touring and exploring and taking photos, we hopped a bus down the mountainside — involving at least a dozen switchbacks and a single-lane gravel road with no guardrail — had lunch (pizza), then took a train and bus back to Cusco for a well-deserved shower and a clean soft bed. Sometimes my nerdiness takes over and I end up doing the darnedest things. Today I finished a project, the results of which are pictured above. Yes, I painstakingly (and rather expensively) constructed this pixel art tribute to my favorite retro arcade game, Snow Bros, out of 285 LEGO bricks in nine colors. It stands 10″ tall. Why did I do this? Nerdiness.